Never opened or used. Does not include any minutes or any promotion. Over 100,000,000 served. FREE scheduling, supersized images. Back to Top. Poor: Thesedevices will have a cracked digitizer, cracked LCD screen, bad touch screen, cracked housing. WE ARE NOT A REPAIR CENTER OR REPAIR TECHNICIANS. Good: These devices will show signs of previous usage, with nicks, scratches, and or scuffs. Microsoft Lumia 435 8GB Black Unlocked B *VGC* + Warranty!! Carrier :See Title (the title normally stated which carrier it's with or unlocked). Warranty : RFG Warranty. If the color is not specified in the title, it may vary/different from the photo shown. We are with. 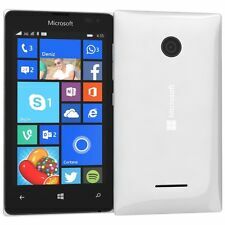 Microsoft Lumia 435 8GB White Optus B *VGC* + Warranty!! Warranty : RFG Warranty. If the color is not specified in the title, it may vary/different from the photo shown. We are with. Microsoft Lumia 435 Windows Phone. Model : LUMIA 435. DEVICE IS TURNING ON AND WHEN UNLOCK IT, IT GET STUCK IN BLACK SCREEN EVEN RESPONSE. SOLD AS IS. ===NO ACCESSORIES (CABLE, BATTERIES, LENS)===. Specifications are subject to change without notice. Upon testing, the phone is fully functional. Microsoft Lumia 435 (RM-1070). Fully Functional. There are no exceptions. IMPORTANT INFORMATION. Box was opened to verify contents. Microsoft Lumia 435 8GB Black Telstra B *VGC* + Warranty!! It’s a smartphone experience that’s normally found on more expensive high-end phones. Connect with the people you love. Try Windows Phone. Video calling with Skype. Black colour - boxed with all genuine accessories. Microsoft Lumia 435 Orange. The best of Lumia. Nice little Windows phone. Ideal as a spare or extra with expandable drive up to 128GB. Put your music or photos on here and save money on all that Cloud storage you don't need. In very good condition with no marks or scratches. Microsoft Lumia 435 - 8GB - Black (Unlocked) Smartphone. Original Box. UNLOCKED & SIMFREE TO ANY NETWORK. Editing and sharing is easy too. Perfect for music loves, Lumia 435 features MixRadio, so you can stream hand-picked mixes from different artists and genres and save them on your phone to listen to offline. Microsoft Lumia 435 - 8GB - Orange (Unlocked) Smartphone. Original Box. Microsoft Lumia 435. Unlocked to all networks / simfree. Fone Dealer Ltd. favourites list ! 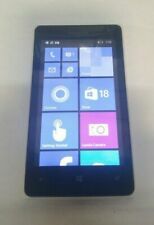 Microsoft Lumia 435 - 8GB - Black EE network locked Smartphone Grade A . GRADE C: this phone is in a more than used condition and it has heavier than average scuff marks on it over the display and casing ( more of an aged condition with more than its fair share of marks on the front and rear do not expect a good condition phone it will be fully usable but not in great condition). 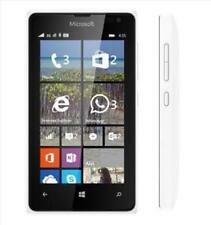 These handsets are quality used devices that have been fully tested and are in excellent working order. For the age of the handset they have been well used and will show signs of wear. Most of the wear can be hidden by a case and behind a screen protector! The item is UNLOCKED to be used with all networks INCLUDING the 3G network. In case of any problem we will help. Fast service. This is due to aviation laws and not my choice. Microsoft Lumia 435. Unlocked to all networks / simfree. We will try our best to resolve any issues that you may have. Fone Dealer Ltd. favourites list ! POWER BUTTON checked and fully working ✔️. 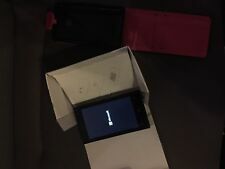 Microsoft Lumia 435 - 8GB - Black unlocked Smartphone Grade A . Grade B- This phone is between a grade b and c so it is not in good condition but it is in bad condition, it may have a few knocks and scuffs but nothing excessive for a phone of its age. MICROSOFT LUMIA 435 (EE) WINDOWS PHONE PHONE AND GENERIC USB CHARGER INCLUDED USED VGC CONDITION ANY QUESTIONS PLEASE ASK BEFORE PURCHASING WHEN CONTACTING US, PLEASE NOTE Our opening times are Monday to Friday 9.00am to 5.00pm. (Thursdays 9.00am to 7.30pm) We are closed at weekends, and banks holidays. If you are contacting us outside of these times then please be aware that you may not receive a response until the next working day. Dual SIM (Micro-SIM, dual stand-by). Microsoft Windows Phone 8.1, planned upgrade to Windows 10. Video/photo editor. OneDrive (30 GB cloud storage). MP4/H.264 player. MP3/WAV/AAC player. Vibration; MP3, WAV ringtones. Microsoft Lumia 435 - 8GB - Green (Unlocked) Smartphone. Original Box. 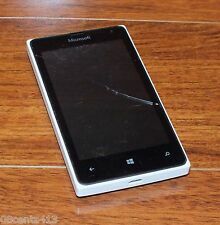 Microsoft Lumia 435 8GB (Unlocked) White Smartphone - Grade A - Warranty. The item is LOCKED to be used with the O2 and TESCO UK networks only. In case of any problem we will help. Fast service. This is due to aviation laws and not my choice.